Overview - From the billboards in Times Square to the barren streets of Sâo Paulo, documentarian Morgan Spurlock shines a light on the world of product placement, marketing and advertising through his new film, fully financed by the very product placement the movie explores on screen. Spurlock unmasks the marketing process, bringing audiences directly into the pitch meetings and marketing presentations which inform our everyday entertainment decisions. Our world is littered with advertising. Everywhere we go and everywhere we look, there's a commercial, flyer, or billboard waiting to lure us in with manipulative images and catchy slogans. Hell, we've reached a point now where one can't even use a public restroom without being bombarded by product placement. In fact, this review itself is brought to you by the various ads you see toward the top and right of the page (please, go ahead and click on them, you know you want to). From the shameless and in-your-face, to the more subliminal, subtle, and specifically targeted, the world of marketing has evolved into a complex science. It should come as no surprise then that this fascinating field has now become the subject of a tongue-in-cheek, meta-documentary from 'Super Size Me' director Morgan Spurlock. Titled 'The Greatest Movie Ever Sold,' the film attempts to examine the intricacies and effects of modern marketing techniques by following the affable filmmaker as he actually tries to fund the documentary itself through product placement. With a self-referential and playful tone, the movie ends up being an entertaining but not altogether successful effort, one that, despite a refreshingly transparent approach, never goes quite deep enough into the concepts it examines. The documentary follows a pretty simple and straightforward structure that sees the filmmaker scrutinize advertising, and more specifically product placement, which invades other art forms, including film and television, by integrating into the content itself. To further the examination, Spurlock actually litters his own movie with cooperate sponsorship in an attempt to document the process firsthand. The filmmaker provides narration, guiding us through the events on screen with additional facts, information, and personal insights. Utilizing a handheld, slightly raw shooting style that employs an almost constantly moving camera with frequent zooms and rack focusing, the proceedings are given an intimate and personal feel that forgoes the more clinical, static set ups of other interview based documentary efforts. The film is essentially comprised of two major arcs. The first half of the movie focuses on Spurlock as he actually tries to convince ad agencies and various companies to come aboard and fund his documentary, which in itself is literally about getting companies to come aboard and fund a documentary, which is about getting companies to come aboard to fund a documentary, which is about… well, you get the point. The other half of the movie deals with the filmmakers' attempts to market the documentary itself, which adds yet another layer to the increasingly complex web of self-aware material. Also sprinkled in throughout the running time, are interviews with various participants, ranging from Ralph Nader and Quentin Tarantino, to numerous marketing gurus, critics, and experts, all discussing the commercial world's effects on film, television, pop culture, the human brain, and society itself. The heavily self-referential concept, coupled with Spurlock's general, every-man likeability, help to create a fun and satirical tone that engenders a perpetual "nudge, nudge, wink, wink, say no more" atmosphere and sense of humor. Through the various pitch meetings with corporations, we are given a peek behind a curtain that is usually tightly closed. Getting to see how the process works firsthand and witnessing the many rejections is both interesting and entertaining. When potential backers do eventually sign on (including the likes of POM Wonderful, JetBlue, and Ban) the doc picks up momentum and we soon watch as the movie literally comes together before our eyes. Some conflict even arises when Spurlock gradually starts to question his endeavor as demands from the companies begin to impede on his artistic integrity. This sets up one of the movie's central questions. Can a film that is funded by product placement, that is actually about product placement, really be more than just one long commercial? Can it actually be art? It's an interesting dilemma that leads to some occasionally thoughtful commentary along the way. That is, in between all of the shameless marketing and constant barrage of products, slogans, and logos, that includes three specifically produced full-length commercial spots for POM Wonderful, JetBlue, and Hyatt. Unfortunately, though 'The Greatest Movie Ever Sold' remains entertaining throughout, the film never completely follows through with its initial goal. Spurlock succeeds in getting his movie made through product placement, but we're sort of left without an actual point. We do get to see a lot of the inner workings of the marketing world, and we do get a rather intimate look at how the artist/sponsor relationship works in practice, but it never really adds up to a whole lot. Some of the observations made along the way are worthwhile, but the actual end result feels a little hollow and futile. There are indeed interesting bits revealed about marketing techniques and practices, but these sequences actually have little to do with the central mission statement of the movie, and could have been just as effectively illustrated in a more straight forward documentary about marketing. While creative and certainly fun, the central, high-concept aspect of the film just doesn't carry the impact it should. The constant stream of products and logos effectively mirrors and exaggerates our current commercial climate, but it never really comes together to imply any kind of meaning beyond a one-note joke. With that said, to Spurlock's credit, the proceedings never fall into completely worthless, superficial territory either, and his fears of creating an empty ninety minute commercial are thankfully avoided. With a clever premise and an entertaining, very meta style, Morgan Spurlock reveals the intricacies behind the contemporary marketing world with a sly wink and a wry smile. By literally becoming a "sell-out," the filmmaker effectively examines what that concept really means, and somehow manages to retain enough artistic integrity to save the film from disaster. Or does he? This brings us back to the movie's central question. Can a film about product placement, that is funded by product placement, actually be legitimate art? After all, despite some occasional, genuine creativity and intelligence, in many ways commercials are the total antithesis of art, and the movie is intimately entwined with that medium. In the end, it's really up to each individual viewer to decide, but as far as I'm concerned, the short answer is a slightly unenthusiastic... yeah, for the most part. Though, the whole conceit of the documentary never completely clicks on a meaningful level, the filmmakers certainly offer enough honest and witty observations to make the effort worthwhile. 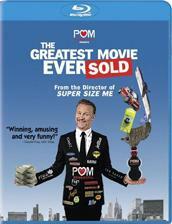 Sony brings 'The Greatest Movie Ever Sold' to Blu-ray on a BD-50 disc housed in a standard case. After some skippable trailers, the disc transitions to a standard menu. The packaging indicates that the release is Region A compatible. The movie is provided with a 1080p/AVC MPEG-4 transfer in the 1.85:1 aspect ratio. The vast majority of the footage was shot digitally in high definition, and while never impressive, the video has a mostly pleasing look. The HD footage is clean, though there is some minor noise and artifacting visible from time to time. The few instances of standard definition material (mostly commercials, seemingly ripped from the internet) are more problematic, and feature various artifacts, though they don't hurt the presentation much. Detail in the HD material is good, but the image has a mostly flat appearance. Colors are nice and natural yet never offer any real instances of pop. Black levels fluctuate a little but mostly remain deep. Whites tend to waiver a bit more, and can often appear overexposed and blown out depending on the location and shooting conditions. The video here gets the job done just fine and while clarity is good, the inherent nature of the documentary shooting style and the equipment used, don't lend themselves to very impressive visuals. The film is presented with an English DTS-HD Master Audio 5.1 track. English, English SDH, French, and Spanish subtitle options are also included. Though fairly basic and restrained, there are a few bursts of immersion and auditory excitement peppered throughout. Dialogue and narration are clear and easy to understand, but quality can vary slightly from interview to interview depending on conditions. Surround use and directionality are minimal, but there are indeed instances that take advantage of the entire soundscape. This is most evident in two sequences where Spurlock gets overwhelmed by the information and manipulation he's confronted with, sending voices circling around the room. Dynamic range and bass are fairly flatlined, but there is some jolt in the film's musical score of original and classical selections. Balance within the mix is good, placing emphasis on Spurlock's narration and the participant's interviews. Like the video, the audio mix is fairly run-of-the-mill, but it does provide a few lively moments. The track suits the material just fine and doesn't overpower the subject matter. Sony has included a decent set of supplements, including a commentary, deleted scenes, and some behind-the-scenes featurettes. All of the extras are presented in 1080p with Dolby Digital 2.0 sound and optional English subtitles. Commentary with Director Morgan Spurlock, Producer Jeremy Chilnick, Cinematographer Daniel Marracino & Editor Thomas M. Vogt - This is a pretty comprehensive and entertaining track. The group of filmmakers bounce off each other well and provide a fairly laid back and relaxed tone to the conversation. Some topics touched upon include the music used, the origins of the idea (apparently the whole movie is inspired by an episode of 'Heroes'), the shaky camera work employed (influenced by 'Battlestar Galactica'), and more details on the various pitch meetings, contracts, negotiations, and many rejections. Filled with numerous insightful bits that pull the curtain back even more on the process, fans of the doc will definitely want to take a listen. Deleted Scenes (HD, 49 min) - Twelve deleted scenes are included and are available to view separately or together. The scenes mostly consist of some extended interviews and additional pitch meetings, including a conversation with Dan Rather about the sordid state of investigative journalism. In addition, there are some more insights involving alternative marketing methods and a rundown of the various participants' favorite commercials. Also, it is important to note that the packaging indicates that about fifteen minutes of this material is exclusive to the Blu-ray, but unfortunately, it is not specific about which scenes. Commercials (HD, 4 min) - Four commercials consisting of the POM Wonderful, JetBlue, and Hyatt spots featured in the film, and the JetBlue in-flight video and Hyatt welcome videos that feature Spurlock, are included, available to view separately or together. Workin' Nine to Five (AM): POM Behind-the-Scenes (HD, 4 min) - This is a behind-the-scenes look at the making of the POM Wonderful commercial seen in the movie with some interviews and on-set footage. While not essential viewing it is interesting to see how much work goes into such a short and seemingly simple piece. Theatrical Trailer (HD) - The theatrical trailer is included. 'The Greatest Movie Ever Sold' is a fun and unique documentary that features a clever and very self-aware concept. Though successful on many levels, the film never delves quite deep enough into its subject matter to truly offer a meaningful experience. Video and audio are serviceable, reflecting the modest source elements. Supplements are decent, offering some welcomed insights into the production. While not a particularly great disc, this is still worth a look.